We want Fair Pay and Management Fair Play! 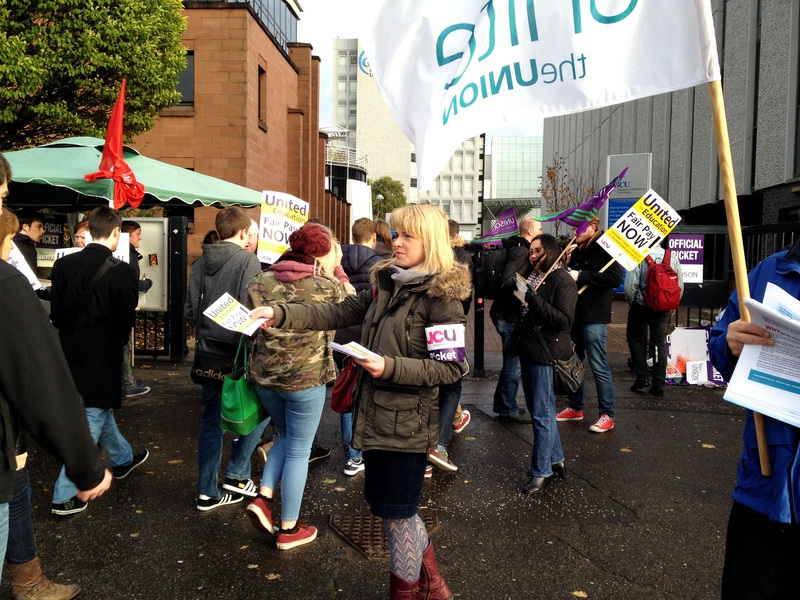 The UCU at Glasgow Caledonian today announced their regret at the GCU management’s decision regarding forthcoming industrial action, which threatens to massively increase the disruption faced by students at GCU. The union had informed management that there will be a strike for exactly 2 hours, between 11 – 1 on Thursday 23rd January. Staff during this time are invited to attend an extended coffee/tea break in the Student Association bistro, after which they will return to their work, fulfilling their contract as professionals. Unfortunately HR have informed all staff that those who participate in this and return to work ‘will be regarded as working in a voluntary capacity’ and will not be paid for the hours they work. The view of the UCU branch is that staff should not be intimidated by the messages from management at GCU and that we need to show our support for the campaign and for the future of Higher Education in Scotland and the UK by standing firm. The gap between ordinary staff and senior management, not just in pay, but also in many other aspects of the job, is growing wider and wider. This impacts not just on the financial wellbeing of staff – it also impacts on the general wellbeing of staff and upon our self-respect and dignity at work. In turn this impacts on the service we are able to deliver to students and so on the student experience. Please speak to your colleagues so that you can buddy with others as you walk out at 11am and make your way to the Bistro. 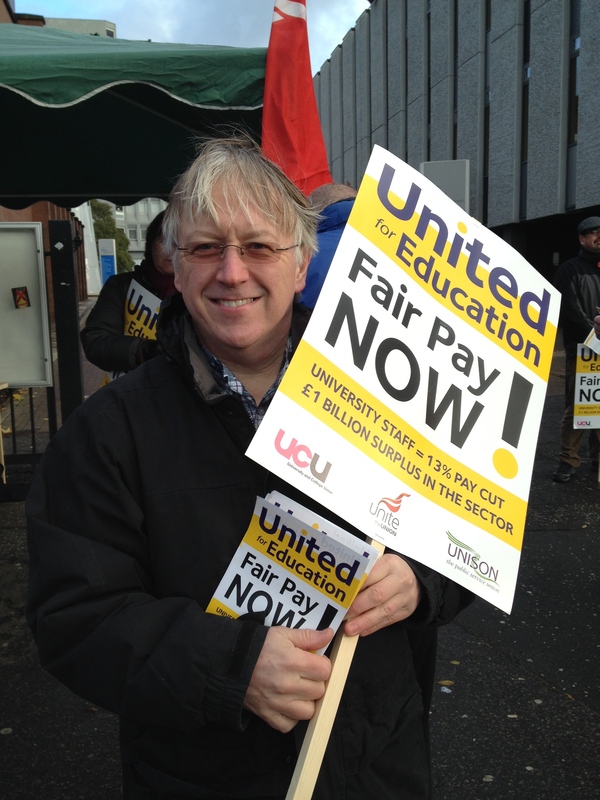 This entry was posted in UCU and tagged Douglas Chalmers, Michael MacNeil, Pamela Gillies, Sally Hunt, UCU on January 21, 2014 by unionadmin. Members of all university unions were present at the inaugural ceremony installing Professor Muhammad Yunus as new Chancellor of the University on Friday 26th October. 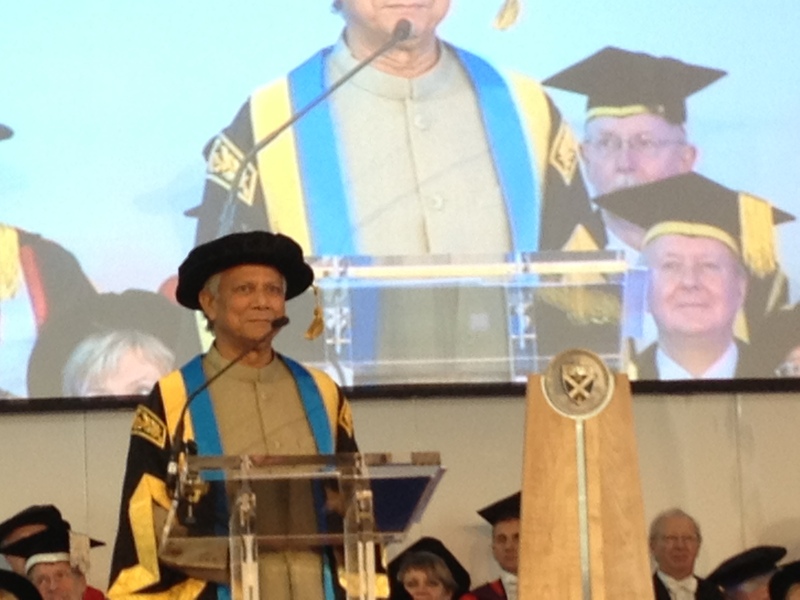 During his installation, Professor Yunus spoke of the need for universities to solve global problems, but suggested that the biggest challenge was often right next to campus – within the neighbourhood. Drawing on his own experience, he developed the idea of the ‘village’ as a real university saying that ‘without community engagement, the concept of a university is empty – the village is a real university‘. He praised the potential in this generation of young people, suggesting they could be the most powerful generation ever – in fact he wondered if young people were yet aware of their real powers. He suggested young people needed to ‘redesign’ the whole system – ‘before the system trashes you, trash that sort of system‘. Arguing that, if taught correctly young people could create jobs, not just seek them – he believed that universities were not factories to make ‘jobseekers’ – each human being could ‘create a new world‘. This world as at present was ‘finished’. We needed to aim for the next 25 years, where poverty didn’t belong to human society. He finished by arguing that young people were not ” ‘future leaders’, they were leaders already, and that universities should help make that happen“. 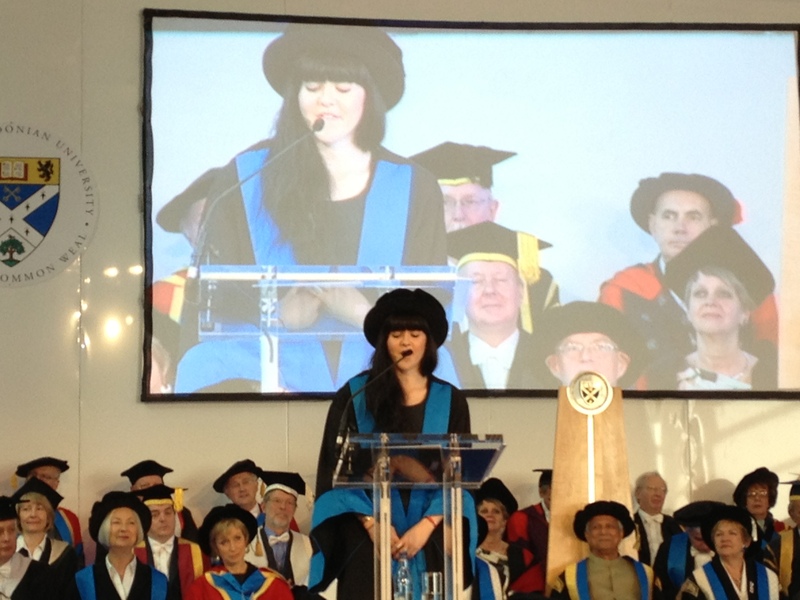 During the ceremony, which had been opened by Principal Pamela Gillies, Student President Carla Fyfe welcomed the Chancellor on behalf of the students, and Cabinet Secretary Mike Russell also spoke welcoming the Chancellor. 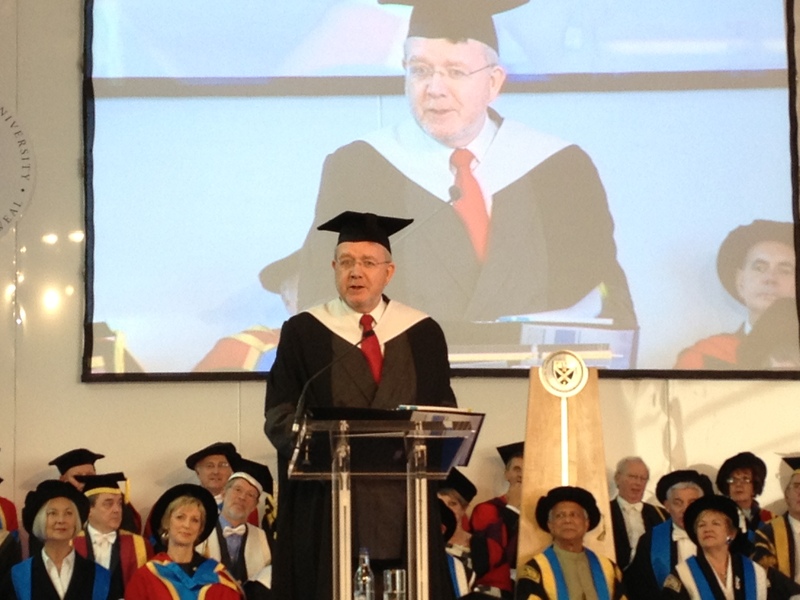 Of interest to the unions, and the university community as a whole, Mike Russell stated that the Scottish government didn’t want to administer a glorified poor law from Westminster, and also talked of how education changed lives, which was why the Scottish government would continue to invest in it. He also pledged continuing Scottish government support for free education. This entry was posted in Governance and tagged Carla Fyfe, Douglas Chalmers, Governance, MIke Russell, Pamela Gillies, Yunus on October 28, 2012 by unionadmin. An independent review of Higher Education Governance in Scotland today called for fundamental change in the way universities are governed. Governing bodies need to better show that they observe principles of good governance, regularly reviewing their own performance. Meetings of University Court should normally be held in public. At least forty percent of the Court membership should be female, and membership should also reflect principles of equality and diversity more generally. Senior managers other than the Principal should not be Court members, nor attend unless for specific agenda items where their attendance is deemed necessary. Chairs of Court (which should now be an elected post) should work closely with Principals, but be independent of them. University Principals’ performance should be appraised by external governing body members, staff and students. Their method of appointment should be reformed. Remuneration committees should include staff and student members. The panel looking into change also recommended that the role of trade unions in university governance should be enhanced. The report (copy here) has already been welcomed by university unions. We expect that it should be welcomed by our University Court in the interest of good governance. University unions would welcome a real discussion with representatives of the Court on this document as well as on the shocking revelations of the staff survey. This should of course be of a more serious nature than ‘staff listening’ events – which it appears even the Principal’s office is now recognising do not work. We have also written to Principal Gillies’ representative asking that the Principal attend meetings of the Joint Consultative Committee (as was standard practice with previous Principals). We will report back on her response to your staff representatives. This entry was posted in Combined Union Committee, Court, Executive Board, Management and tagged Combined Union Committee, Court, Executive, GCU Management, Pamela Gillies on February 1, 2012 by unionadmin. A hard hitting article by the Herald’s Education reporter Andrew Denholm has brought the shocking results of the recent GCU staff survey into the public’s gaze. Stating that “A survey of staff at Glasgow Caledonian University found just 19% said principal Professor Pamela Gillies and her management ‘lead the university well’ “, Denholm’s report goes on to outline the devastating statistics which have emerged from the management-initiated survey. 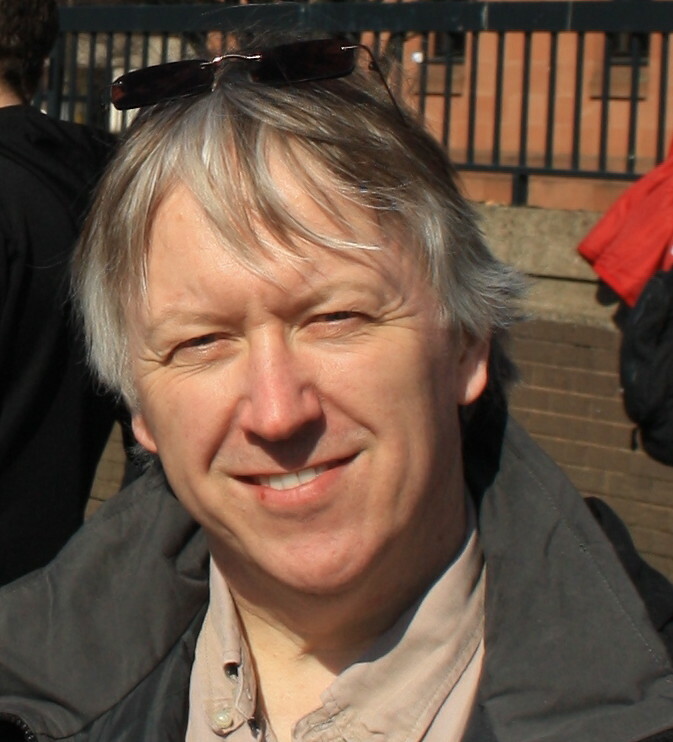 Within the article, Dr Nick McKerral, convener of the university’s combined union committee expresses the point that “although they are obviously committee to their job within the public service of higher education, the figures show that ordinary staff feel ignored by highly paid senior management who have carried through many controversial plans, including attempting to make 95 compulsory redundancies last year”. The full report can be found here on the Herald’s website, and on this blog’s Media Coverage page. This entry was posted in Combined Union Committee, Court, Executive Board, Management and tagged Combined Union Committee, Court, Executive, GCU Management, Pamela Gillies on January 28, 2012 by unionadmin. Fact. The GCU Trade Unions were not consulted about the contents of the survey nor questions within it. Fact. 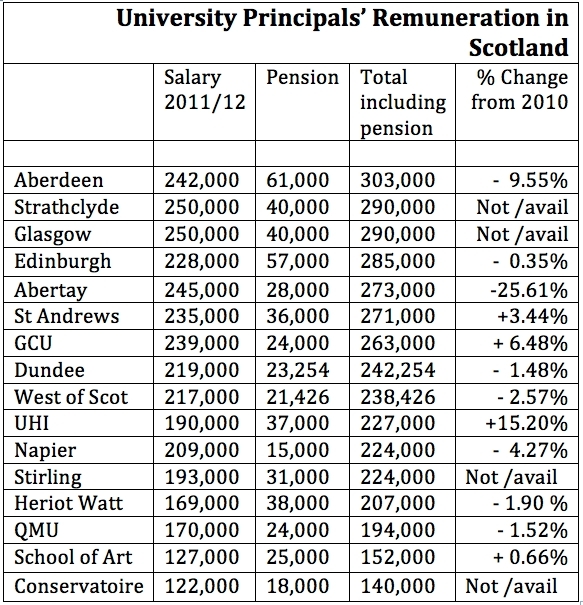 The survey was issued after a long period of senior management minimising real consultation with the unions at GCU. Fact. The result of the survey is a damning indictment of long term inept management at the university which is clearly linked to the practice of ignoring the views of staff and their elected representatives. If this was the business community, boardroom changes would have taken place long before now. Fact. It is about time University Court did something about this and proved they act in the interest of the university community, its staff, the students who we serve, and the Scottish people who deserve more from a publicly funded and top class higher education establishment. While 84% feel valued by colleagues, only 34% feel valued by the University. Staff feel proud of what they do but despair at how they are treated. Only 19% agree that senior management manages and leads the university well. Only 14% agree to any extent that senior management listens to and responds to the views of front line staff. Only 43% – less than half – of senior management agree to any extent that they themselves set out a clear vision of where the university is headed. This can only be described as an abject failure of leadership. Perhaps this is reflected in the fact that a higher proportion of senior management (21%) than staff across the board (19%) are actively seeking to leave the university. Lets hope that this 21% includes the 7% of senior management that isn’t particularly interested in the university – it’s just a job! Very few staff agree to any extent that the changes brought about by restructuring were ‘about right’ (17%), ‘well planned’ (19%) ‘well explained’ (28%) or ‘managed well’ (22%). Even senior management wouldn’t admit to the effective planning (29%), explanation (36%), or managing (36%) of change. Fact: Senior management admit they are not doing their job effectively. In spite of these fundamental issues of concern, 71% of staff agree to some extent that they feel inspired to do their best work every day. Most (70%) still think that GCU is a good place to work and 85% do claim to enjoy their work. What the staff opinion survey shows is that GCU can celebrate its staff – but not its leadership. Any inaction on these statistics would discredit GCU Court as much as senior management seem discredited in the opinions freely given by university staff, – union and non-union members – alike. This entry was posted in Combined Union Committee, Court, Executive Board, Management and tagged Court, Executive, GCU Management, Pamela Gillies on January 26, 2012 by unionadmin.